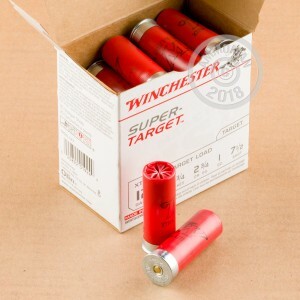 Winchester Super Target shotshells are an economical way to spend countless hours knocking clays out of the sky. This particular 12 gauge load is suitable for trap shooting and sporting clays and delivers good patterning without severe recoil. 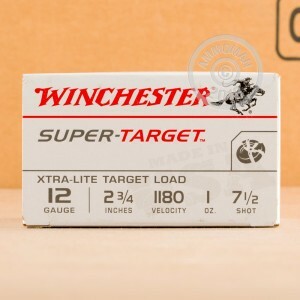 Each shell in this box of 25 throws a one ounce column of #7.5 birdshot at a muzzle velocity of 1,180 feet per second. This ammunition is loaded in Oxford, Mississippi. Place an order that exceeds $99 and AmmoMan.com will provide free shipping!